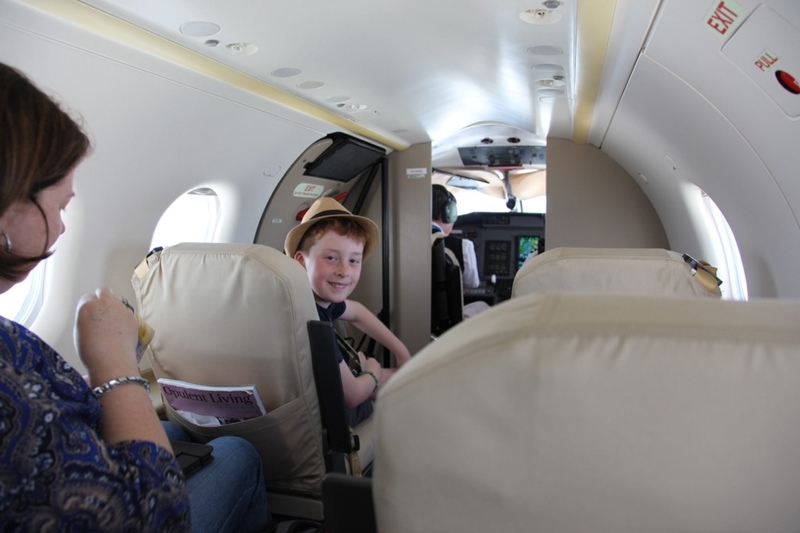 On Sunday afternoon, four days ago, we flew into Tswalu Kalahari Reserve on a small private plane. Tswalu is the largest private game reserve in South Africa; 100,000 hectares of land in the southern Kalahari. Over the past 10-15 years the owners, the Oppenheimers, and their conservation team have worked to renew the land and to return plant, animal, bird and other species lost during periods of farming and hunting in this part of the “Green Kalahari”. At Tswalu you stay in Lodges right at the heart of the game reserve with wildlife wandering past your doorstep! 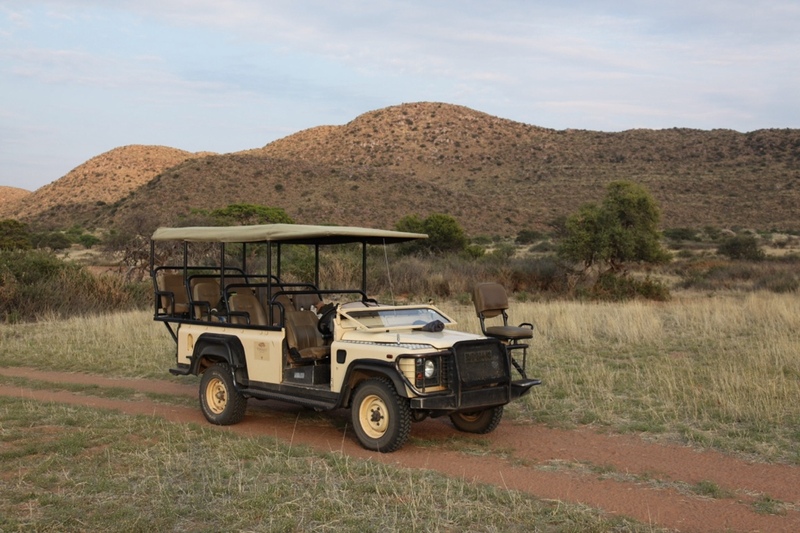 The typical pattern at game reserves in Africa is to go on “game drives” in open safari vehicles early in the morning before sunrise and late in the afternoon as the sun sets. The wildlife is more active early and late in the day as everything and everyone rests during the intense heat of the middle of the day. So our days at Tswalu were broken into morning and afternoon/evening activities with quiet time in between: we returned from our game drives to eat brunch, swim in the pool, rest, play quietly, or read. We were miles and miles and miles from the nearest town so everything revolved around the game drives. At Tswalu, which is a truly luxurious game park experience, each family, couple or group has their own Guide and Tracker. This way we were able to tailor our game drives to the things that Oliver and Louisa were most interested in: learning about tracks, seeing the animals they liked, cutting the drives short when they became tired. This arrangement of a private Guide and Tracker for each group is perfect and a distinctive part of the Tswalu experience; it means that each group has their own needs met. Our Guide’s name was Juan; he drove the safari vehicle and interpreted for us what we were seeing. His knowledge of animals, birds, plants and the surroundings — their look, calls, tracks, habits, locations — was truly amazing! He told us he was born nearby in Kimberley, had worked on a number of game reserves, and is a “bush baby”. He was incredibly passionate about Tswalu and the Kalahari and seemed to be in his perfect job. He taught us the Afrikaans word for “truly awesome” (lekker, which sounded like lacquer to my ears) because he used it so often to describe what we were seeing. If only everyone could find the role in life that suited them so completely! Our Tracker’s name was Ben; he sat on a jump seat at the front of the safari vehicle and looked for prints, scats and other signs of the animals we were tracking. He signalled to Juan the path to follow. Sometimes they both got out of the vehicle and walked around, peering at signs on the ground, or discussing options. They spoke mostly in Afrikaans but it was fascinating to watch them and see how their discussions and interpretations of signs around them led us to, for instance, two Cheetahs or a Leopard or the elusive Desert Black Rhino. These animals were like needles in a haystack in the huge expanse of landscape, yet everyday we found and learned about so many beautiful creatures thanks to Juan and Ben’s encyclopaedic yet somewhat mysterious talents. This entry was posted in Africa, Animals, Destinations, Hotels, Kimberley, Out and about, Planes, Tswalu Kalahari Game Reserve on September 19, 2014 by Amanda Barnier. Hi 3/4T from Oliver in Africa! Hi Sheridan, I liked it too. Their tails are huge and look just like a long white dress. We saw these peacocks in a bird sanctuary in Hout Bay, which is near Cape Town. They had over 100 aviaries full of birds, like owls that were hiding right near the doors. The great thing about these aviaries was that you could walk into most of them, so there were no cages or bars between you and the birds. Hi Lauren, I loved how if you held your hand out the monkeys would reach out and try to open your fingers to see what was in your hand. They felt really light like a feather and their paws felt really soft. They were very curious. They would jump on you from a long way away. One looked right into my dad’s camera. Hi Michael, the hole was huge. When I looked down I felt like if you ever fell down into it you’d never come out. It’s the largest man made hole in the world. They dug it by hand to find the diamonds. 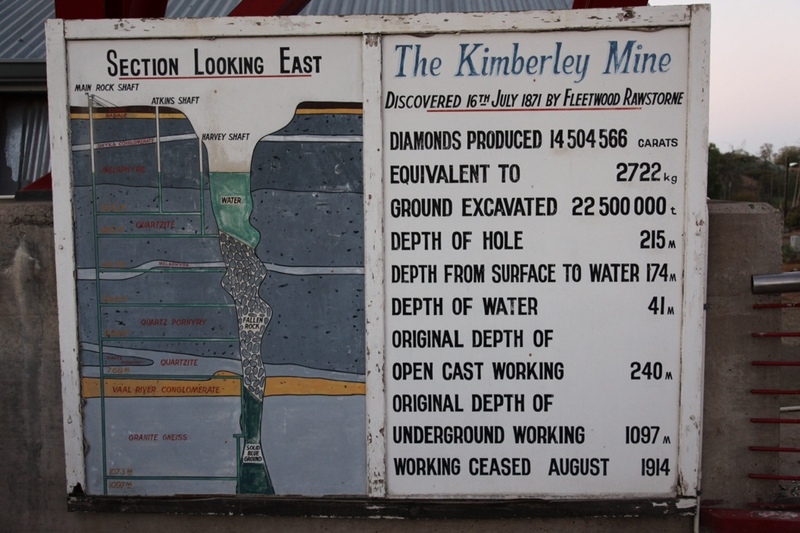 Even though the mine was closed a long time ago (in 1914) there are still diamonds left in the hole. They aren’t going to get them out because if they dig them all out, according to African law, an “exhausted mine” has to be filled back in. And they can’t afford to fill the hole in and return the land to nature. Africa is a once in a lifetime experience so there probably won’t be a next time. But I hope you like my photos! Hi Kate, I was a bit nervous but it wasn’t too scary. The monkeys were really used to humans and getting food from humans. But you had to make sure that you had nothing in your pockets and no jewellery on because they tried to get into everything. They tried to open my dad’s backpack! These were squirrel monkeys. There were lots of other monkeys at the park but you couldn’t play with them because they would bite. Hi Charlie, it was quite scary. 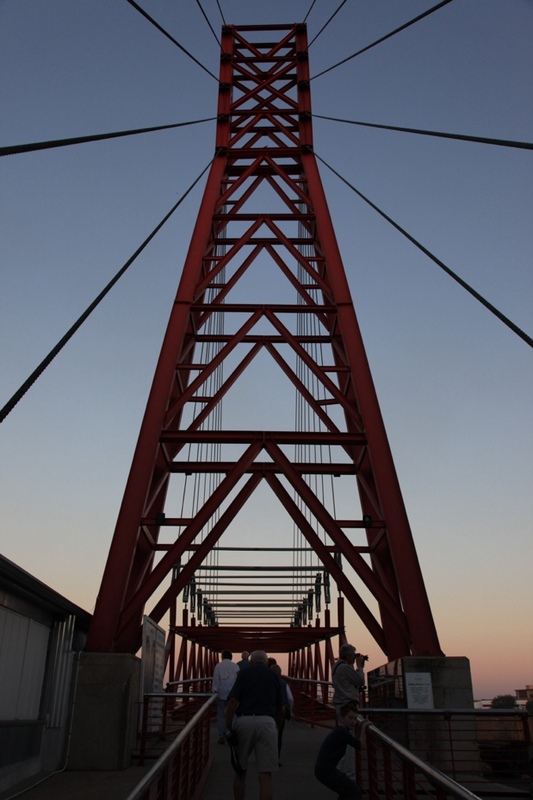 There was a bridge with a huge platform that was just over the edge. We looked over guard rails because if there wasn’t any you’d fall right in. I didn’t ask if anyone had ever fallen in before. When I looked into the hole there was water down the bottom. The hole was brown (earth) and light navy (water). 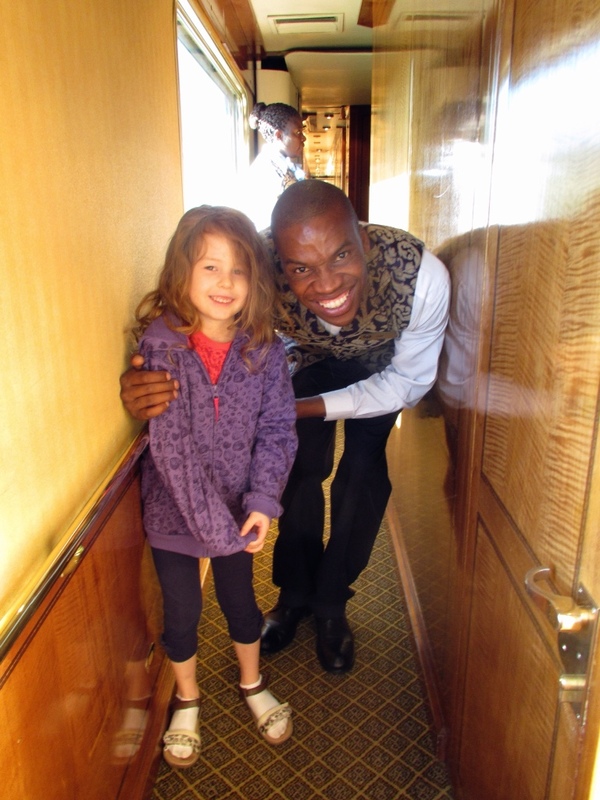 Hi Sienna, my favourite part of the trip is here at Tswalu because of all the animals we’ve seen, the horse riding and bow and arrows. We’ve tracked a lot of animals such as a leopard, cheetahs, lions, baboons, a Black Rhino, zebras and lots of South African animals you probably haven’t heard of such as kudu, springbok, blesbok, gemsbok and others. Hi Jemma, some flamingoes are pink. On our train trip from Pretoria to Cape Town we saw a flock of pink flamingoes on a lake just before our stop in Kimberley. But the kind we saw in Hout Bay were white with some pink colouring. We saw a lot of birds that look like Australian birds but with different colouring. Here at Tswalu there are many beautiful birds with amazing colours and songs. Thanks Cristian. I miss you too and I loved the monkeys too!! Hi Edith, my mum agrees. These were her favourite birds. They sat up high on a branch with their long white tails streaming down like a bridal veil. We also saw more traditional peacocks with the blue and green colours. 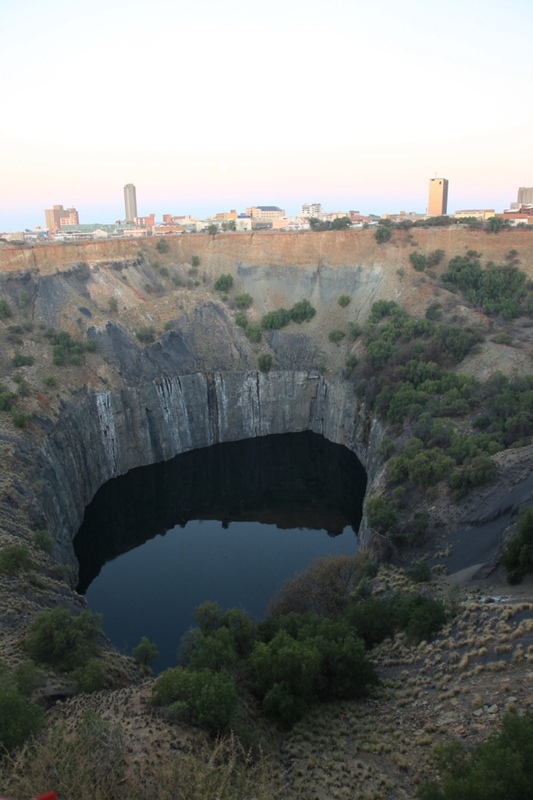 Hi Tom, there are still diamonds in and around The Big Hole but you’d be arrested if you picked up an uncut diamond from the ground. That’s a law in South Africa. In the vault of the Mine Museum we saw huge cut and uncut diamonds, which had been found in the mine. But you couldn’t take diamonds away with you because there was lots of security! Hi Kye, it has been an epic journey. It took 14 hours to fly from Sydney to Johannesburg. Then two hours to drive from the airport to Maropeng. 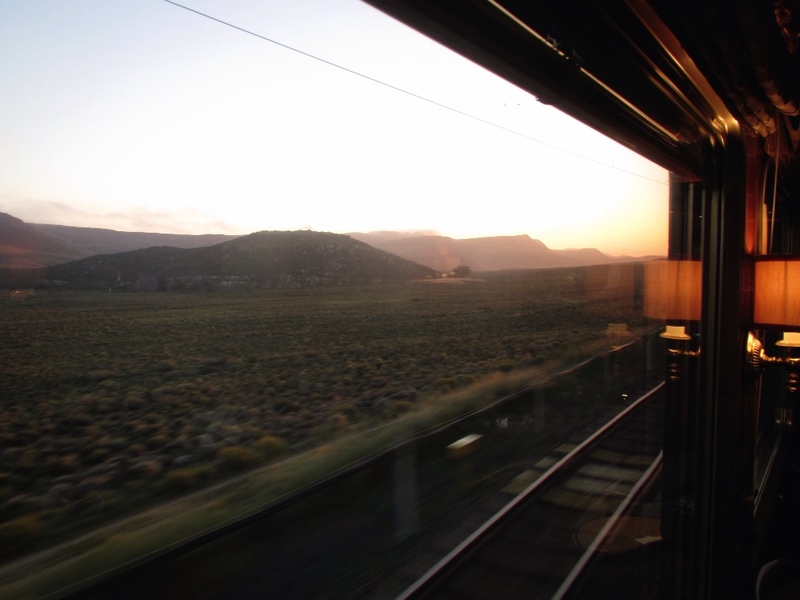 It took 28 hours on the train from Pretoria to Cape Town. Then two hours on a very small plane (with only 8 seats plus 2 for the pilots, who we could see working the controls) from Cape Town to Tswalu. We have a two hour flight back to Johannesburg tomorrow and then a 14 hour flight from Johannesburg back to home. So it has been epic! We’ve also seen so many amazing sights and animals. Hi Prue, most of the birds were really beautiful. The ones with no feathers weren’t so beautiful though! The most beautiful animals I have seen are meerkats, monkeys and penguins. The most scary animals were snakes and the rhino. Rhinos can charge at safari vehicles so our Guide, Juan, had a rifle with him. We were pretty nervous as we tried to get close enough for a good look but not too close to die! Apparently rhinos have bad eyesight but good hearing. So if they hear a threat they charge first and ask questions later! Hi Edward, thanks for your comment. It has been really fun. Your Earthkeepers camp looked really fun too and I was sorry to miss it. But I have learned that it is really important to protect your environment and not do things that are bad for the animals. The people at Tswalu have worked hard over the last 50 years to return this part of the Kalahari to what it was like 200 years ago before farmers came and changed the environment and wiped out many of the local animals. See you soon! From Oliver. 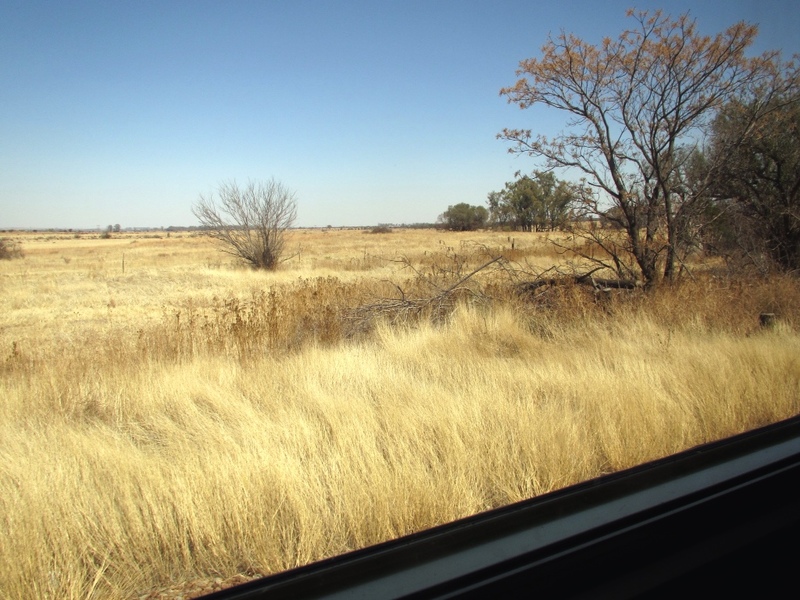 This entry was posted in Africa, Animals, Cape Town, Destinations, Johannesberg, Kimberley, Out and about, Planes, Pretoria, Trains, Tswalu Kalahari Game Reserve on September 17, 2014 by Amanda Barnier. “First we hopped off the train and drove in a van to the Diamond Mine. On the way there our tour guide told us about things that had happened in Kimberley. When we got to the Diamond Mine we went to The Big Hole. And it was huge … gigantic … the biggest man made hole in the world! I’d hate to fall down it! Next we went into the vault and saw cut diamonds. 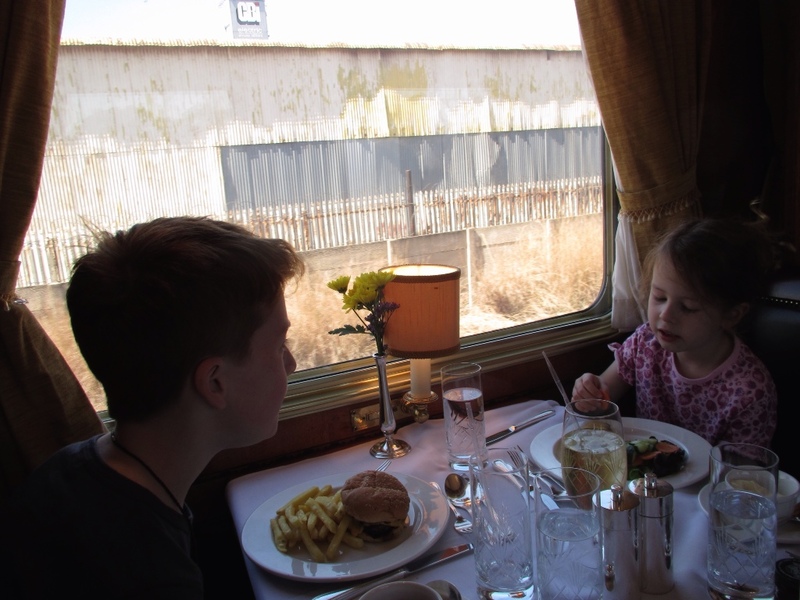 Then we returned to the train station and climbed back on board our train. 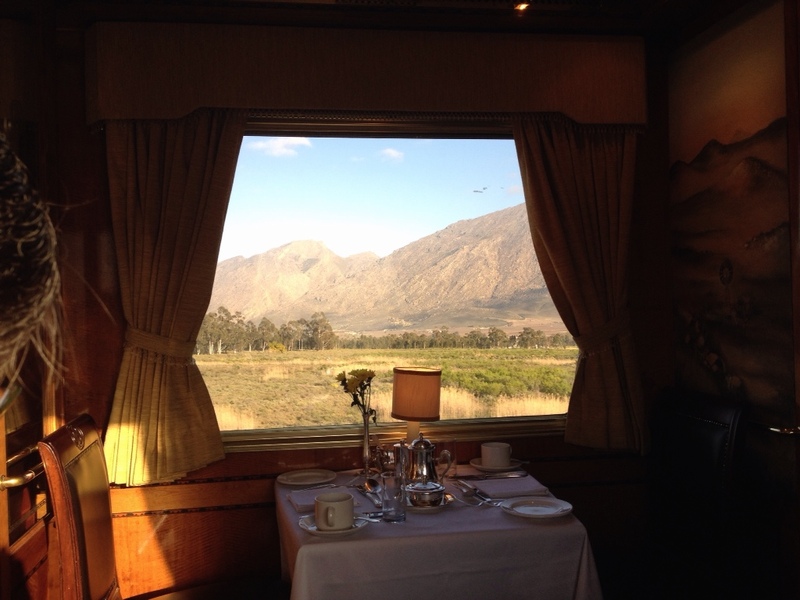 This entry was posted in Africa, Cape Town, In transit, Kimberley, Out and about, Pretoria, Trains on September 14, 2014 by Amanda Barnier. “It is good to have an end to journey towards; but it is the journey that matters, in the end.” Ernest Hemingway (thanks to Oliver’s teacher, Mrs Taylor, 3/4T at Boronia Park Public School, Sydney, for the quote). I am sitting in the dark on a train travelling from Pretoria to Cape Town. We started our journey this morning in Gauteng Province and headed south to Johannesburg and then to Soweto. Turning south west, we skirted the edges of three provinces as we travelled diagonally across country: North West Province, Free State Province, and Northern Cape Province. 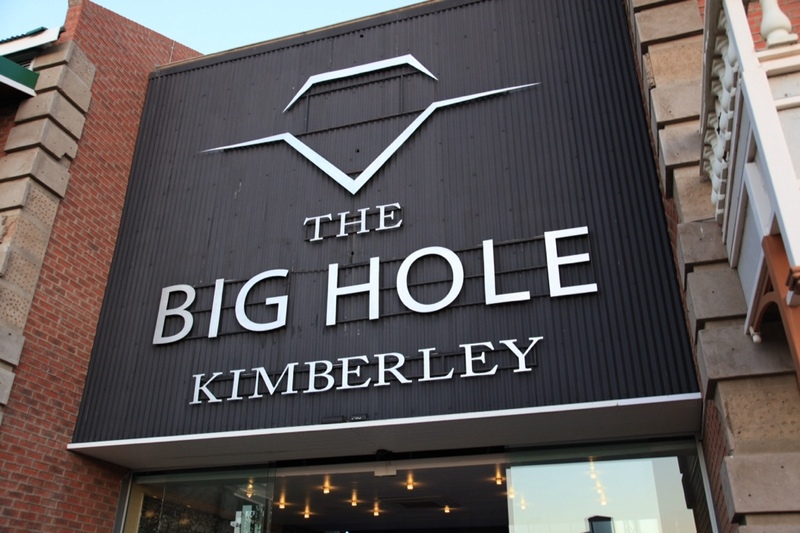 Almost right in the middle of South Africa we stopped in the town of Kimberley, home to the De Beers Diamond Company and their vast open pit diamond mine, “The Big Hole” (read Oliver’s separate post on his excursion into Kimberley here). Tonight, in the dark, we are racing towards Western Cape Province and Cape Town, at the southern tip of the African continent. The train is making those rackety and whistle sounds that remind me of trains in movies. 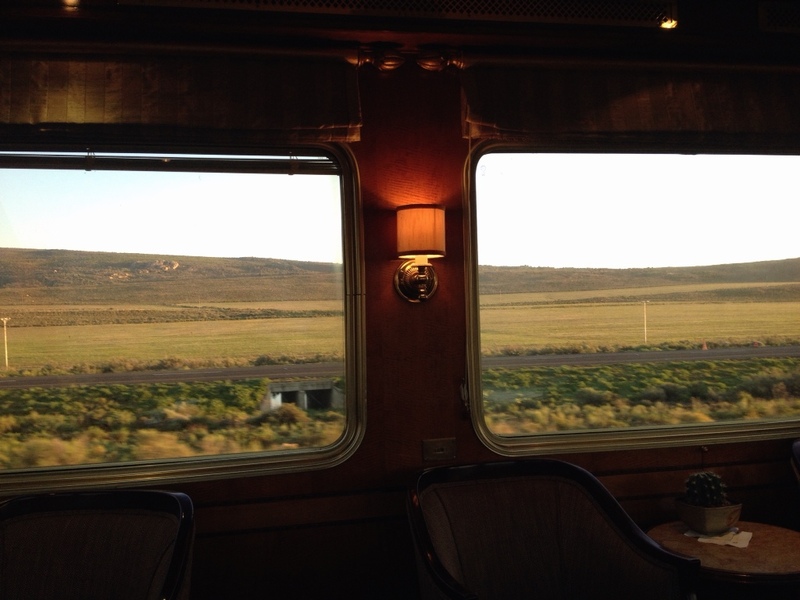 Perhaps the sounds of the train that carried Lara across Russia in Dr Zhivago? 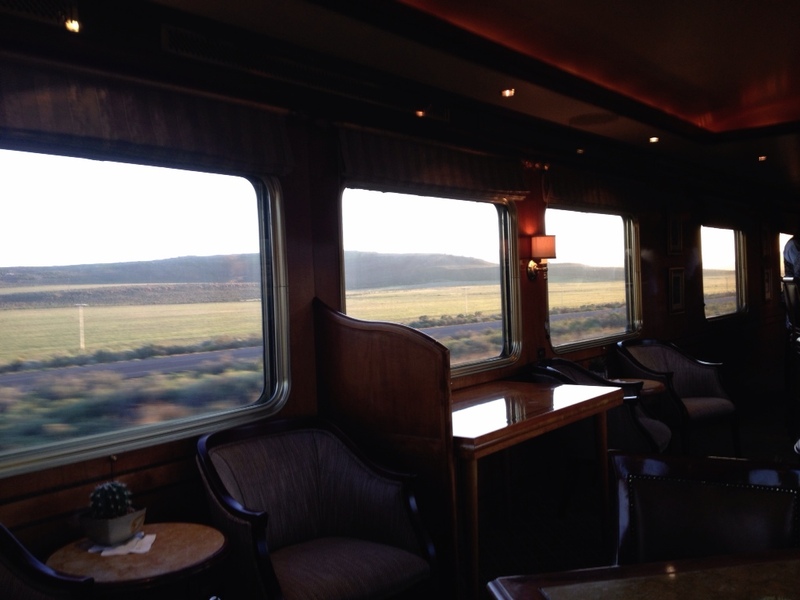 Or perhaps the sounds of the train at the start of a Phryne Fisher mystery? Our cabin has been turned into a bedroom and Louisa is fast asleep in the fold down bed. 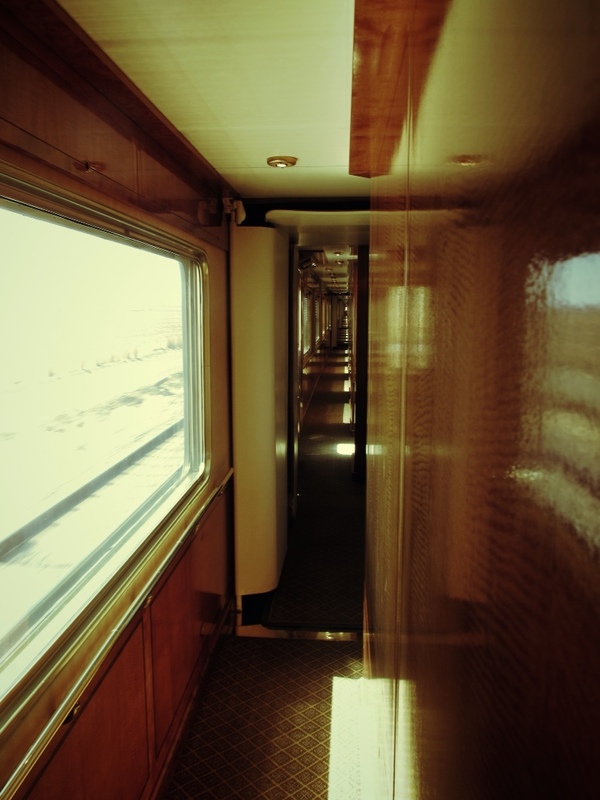 I am sitting looking out of the big picture window in our cabin at the landscape rushing by. There’s a full moon high above us but I can’t make out any familiar constellations in the Southern Sky. There are few towns and only a smattering of lights from isolated farm houses. Mostly it is just moon lit black with vague shapes suggesting geology, vegetation, and the occasional man made object: road or railway siding. 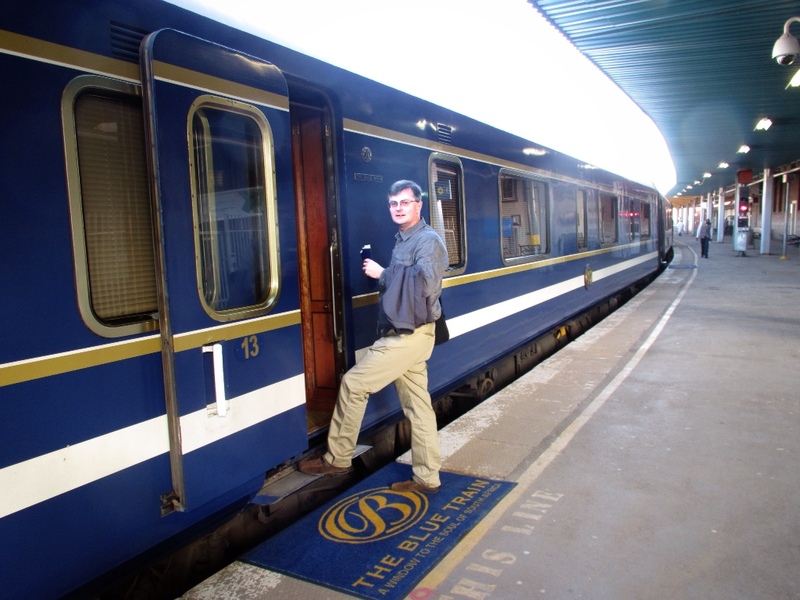 The Blue Train certainly is a luxurious experience. 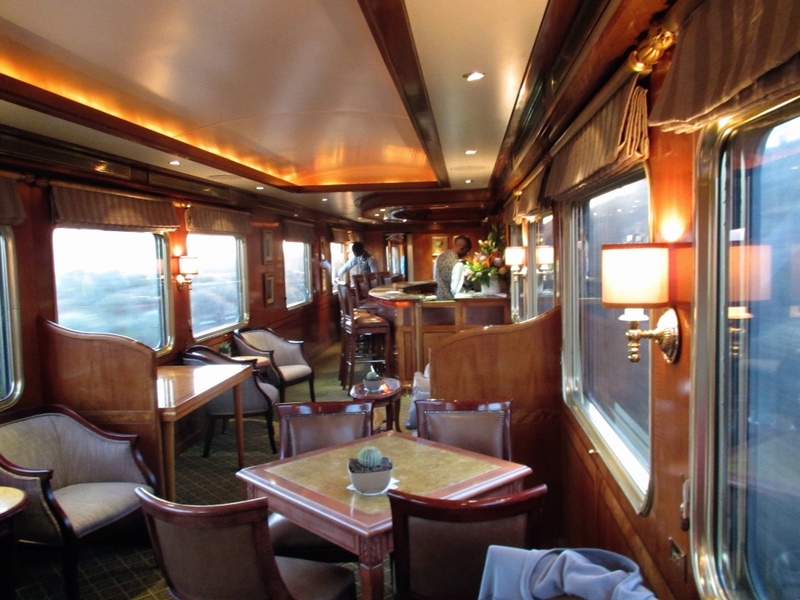 Riding in beautifully appointed sleeper cabins with Italian marble bathrooms; calling the ever patient and gracious butlers to cater to Louisa’s whims; lounging in the elegant surroundings of the Cafe car; and dressing in formal wear for four course meals in the Dining Car. But I must admit that it is a somewhat incongruous experience to be looking out from all this luxe and privilege to a country full of day to day hardships. We passed many shanty towns with tiny dwellings made of tin or wood, sitting in harsh, polluted environments. I am not sure what I was expecting: wild animals running photogenically alongside the train? Huge viaducts spanning deep gorges (of the kind I travelled on at the end of the Otago Rail Trail in New Zealand last year)? Maybe these are to come? 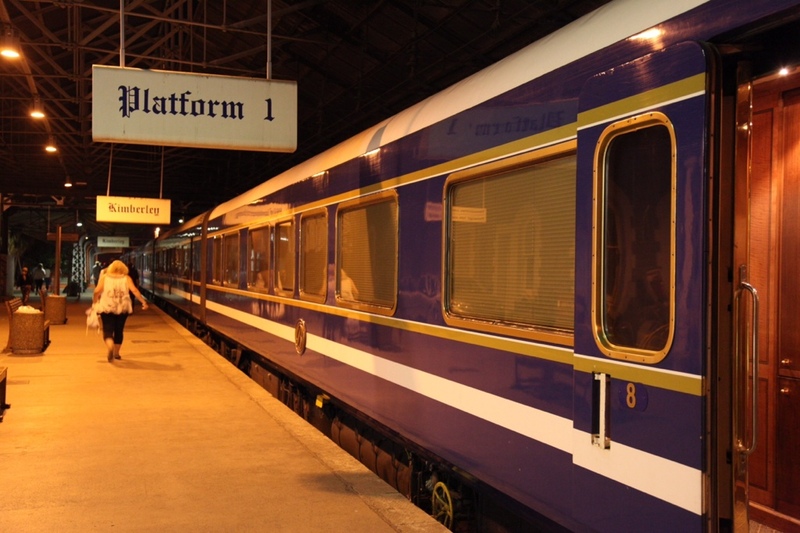 But so far The Blue Train has lived up to its reputation as the “window to the soul of South Africa”. Out of this window we can see the real South Africa, in all its beauty, vastness, contrasts and inequalities. Overnight, lying beside Louisa, I thought I heard animals howling outside. Perhaps howling at the full moon? Louisa and I have been awake since just after 5am looking out of our picture window, waiting for sunrise. I think I can see the Southern Cross low in the early morning sky. 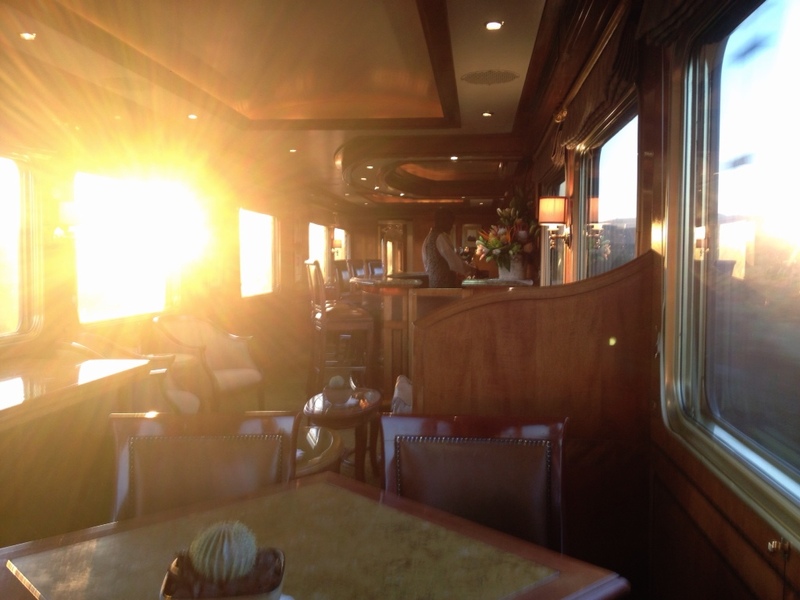 As the sun rose, and we moved to the Cafe Car to wait for breakfast, the scenery outside changed entirely. The flat dry plains of yesterday have given way to mountain ranges and fertile green pastures. Early this morning the landscape was empty of settlements; just a few trucks tooling along nearby roads. Now we are passing scattered farm houses and a few small towns. Certainly no large towns or cities and fewer Township settlements. So perhaps less confronting in its majesty today? And I guess that is the value of this journey. 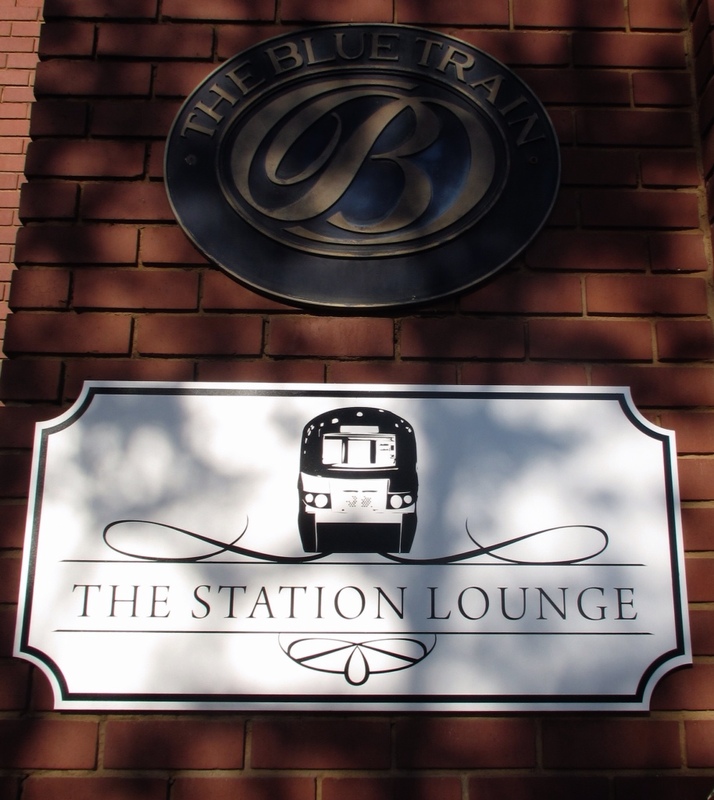 When we booked and boarded The Blue Train we probably thought that the journey worth having, to paraphrase Hemingway, was a journey to spoil ourselves a little as we traversed the country. 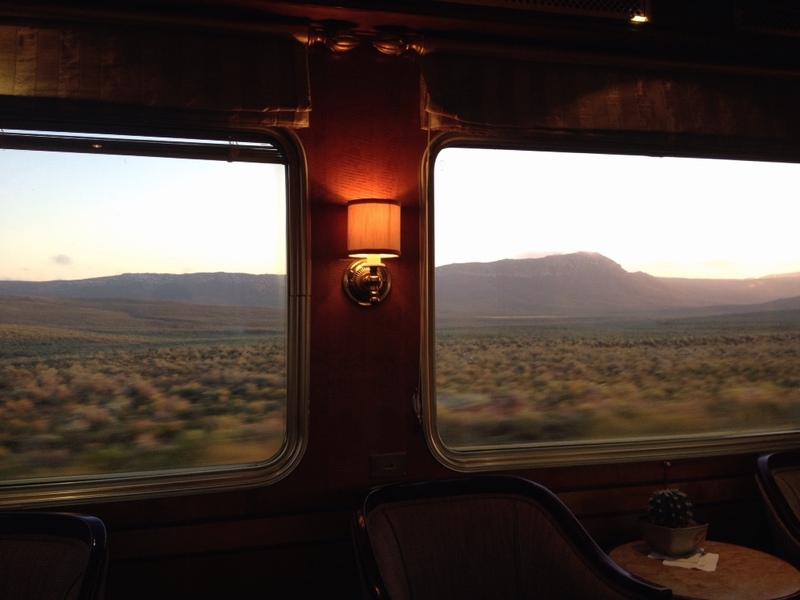 But because the train windows reveal everything and hide nothing, the journey we’ve ended up with hopefully also is one of reflection. A chance to reflect on how fortunate we are in our lives. And fortunate to live in Australia. Australia and South Africa seem somewhat similar in their vast, sometimes inhospitable, landscapes. Are we similar also in entrenched or deepening inequalities? I would like to think not but then we haven’t been on a 28 hour train ride right across Australia! What would we see out the window then? Soon we will arrive in Cape Town where another face of South Africa no doubt awaits us. 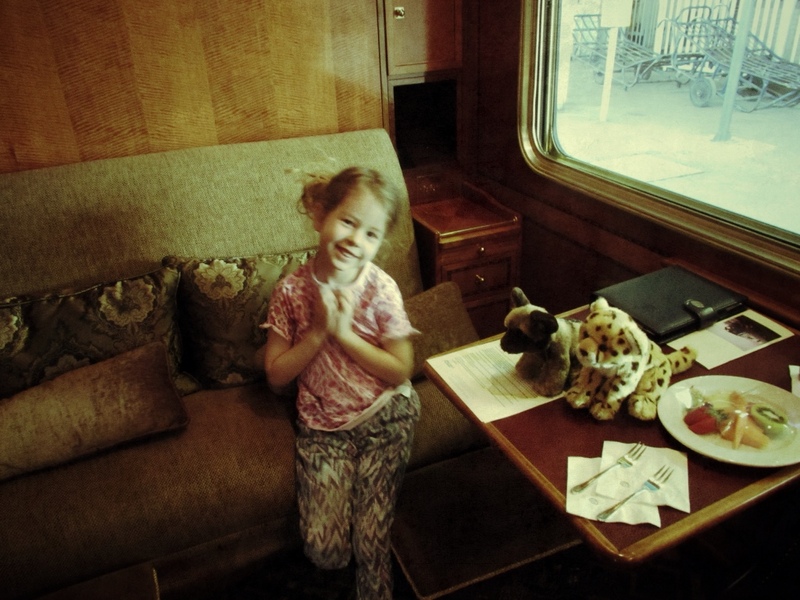 This entry was posted in Africa, Animals, Cape Town, Destinations, In transit, Johannesberg, Kimberley, Out and about, Pretoria, Trains on September 9, 2014 by Amanda Barnier.